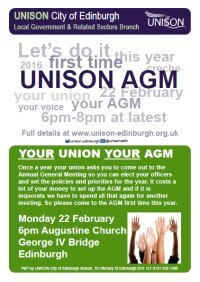 The Branch Annual General Meeting will be held on Monday 22 February 2016 in the Augustine Church, George IV Bridge Edinburgh, from 6pm to 8pm at the latest. Branch secretary Amanda Kerr said: “This is a very important meeting. Please make every effort to participate. With all that the branch faces with cuts in jobs and services and possibly attacks on pay and conditions this is probably the most important AGM we have ever called. A preliminary notice was issued on 15 December 2015. Click here to go to the AGM page on our website for deadlines and how to nominate for officer positions and submit motions.